Here’s the fundamental problem with Pacific Rim: It starts with the concept of “robots vs. monsters”, and then says “gee, how do we make that interesting?” Wait! Stop! There’s your problem: “ROBOTS VS. MONSTERS” IS ALREADY INTERESTING! You don’t have to make it interesting. In fact, you cannot make it any more interesting. It already has its interest level set to maximum. This will take you a long time: You’re not going to have your first monster vs. robot battle until about halfway through. And then, as soon as you’ve had one, you’ve got to start going forward to the ending. When last I visited this topic, I talked about how both Ghostbusters and Groundhog Day were hopelessly convoluted in their first drafts, but the studio process wisely simplified each one down to the its core idea. Unfortunately, that studio refining process has broken down, and the result is this type of big mess. I think Del Toro goes wrong from the first line of the voice-over narration, when the hero says he was 15 when the first kaiju (translation: giant f--king alien f---ing monster) emerged from a portal to another world in the middle of the sea. The story he goes on to tell — how Earth’s weapons were ineffectual and cities leveled, how scientists were finally able to design giant robots that had to be operated by mind-melded (pardon my Trekspeak) pilots — sounds as if it would make a fantastic movie. Imagine that first out-of-nowhere kaiju attack, the decisive failure of tanks and missiles, the frantic arms race as millions perish, the tragic mistakes (in which test pilots die horribly) before neuro-connectivity is achieved ... Did I miss that movie? Or did Del Toro for reasons known only to him decide to make the overblown sequel first? Easy to agree with your assessment of this problem and specific suggestions for fixes. I suppose I'm curious about this particular kind of heavy duty exposition and world-building beginning. 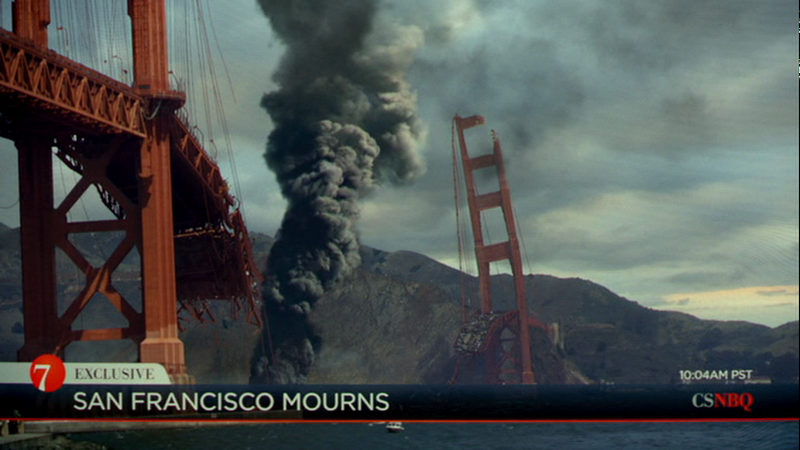 Can you think of any successful examples of the kind of dense opening PACIFIC RIM is forever stuck with? Does it ever work in historical fiction? Is it any easier in full on fantasy stories where the audience comes in expecting things to take place in a very different if not inherently overcomplicated world? The only not-terrible movie I can think of that begins with an endless world-building exposition dump and effects montage before we meet any characters is "The Fellowship of the Ring". It still feels clunky and off-putting there, but that's a movie that, on balance, has enough pleasures to outweigh its flaws. Hmm, as for historical fiction, I guess "Citizen Kane" comes to mind, which words beautifully, but there the montage introduces us to a character, not a world. Weird. I haven't seen PR, so I assumed that it told the story Edelstein described, for obvious reasons. So Del Toro et al. thought the heart of the story was about mecha pilots, and just set a bunch of stuff up to get to the pilots faster. That would work better if the setting were utterly fantastic. If the story's on Planet Zartron of the Blagglegap System, we're less likely to think "wait, what about X" and go with it, since we know we're in an alien place and regular logic may not apply. Putting it on Earth as we know it makes the viewer wonder about this stuff. Hmm... 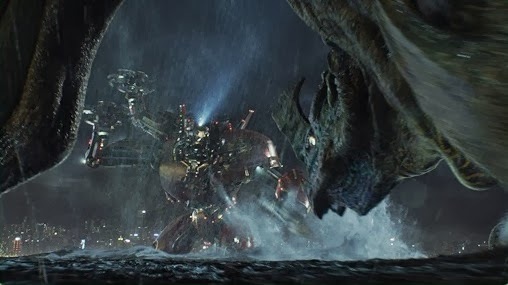 In the "Pacific Rim" How It Should Have Ended (which I suppose I should go ahead and post), it begins with a scene where one world leader is saying that they should nuke the monsters, but all of the others say no, it would so much cooler to fight them with robots. What if they actually had included a scene like that? In other words, what if they had introduced an element of spoof. I'm trying to think of successful half-spoof / half-serious movies. I supposed that, as someone has already mentioned, "Starship Troopers" comes to mind, but that movie never worked for me. though I know it has its fans. Going from the world as we know it (roughly) to something new and exciting is always the most enjoyable - you think "what if I was going through this?" Doesn't work as well when you begin with the world totally askew. This also kind of applies to superhero franchises. The first movie with the origin story, is usually the best.